Our equipment can automatically perform quantum state reconstruction (tomography) in seconds by leveraging high speed gated single photon detectors and electronically controllable polarization analyzers. We also sell a suite of electronic and optical pulsers that create sub-ns pulses of variable width, location, and repetition rate. 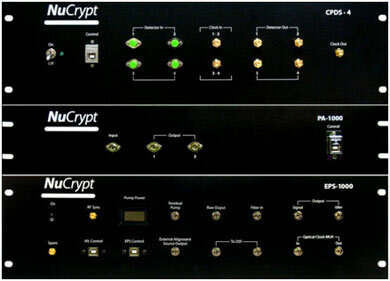 NuCrypt has developed a variety of cutting edge prototypes such as an ultra-secure high rate noise-enhanced encryption system that was demonstrated in an airborne free space link, and performs research and development in a variety of areas such as microwave photonics. We have deep knowledge of fiber optics, nonlinear optics, electronic control systems, communication systems, optical measurement technology, and quantum optics. Our systems have features that make it easy for the user to make normally complex measurements. We specialize in creating self-contained systems that requires no additional equipment of any kind. We will work with customers to integrate any of our technologies, perform independent assessments of competing technologies to find the right match for the end user, or help with the design and testing of prototype systems. We have been providing cutting edge technology and professional expertise to clients for more than a decade. Check out all our technology portfolios.